I have so many of these little post it notes all over the house to keep me reminded of what has to be done before we leave tomorrow. On top of the that, I have a list (or two or three) to help me keep on track so I will not forget anything that could have been missed on any of the post it notes. Really it is quiet insane. One child still fast asleep (it is now 9:30), and we have so much to get done. 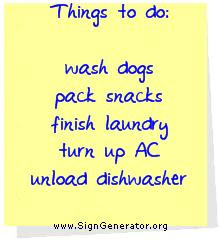 Not to mention that Nate has a 2nd orthodontic consult today, Spencer wants to go swimming before the Dr’s appt, laundry, house to tidy up, clothes to pack, plants to water, a dog to wash and some errands to run. I am off to look at a list to plan the next course of attack for this morning. Now the question is what list to look at? !